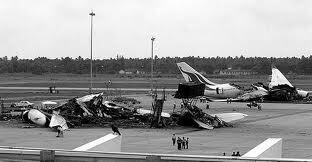 The Bandaranaike Airport attack was an assault by the Liberation Tigers of Tamil Eelam (LTTE) on Bandaranaike International Airport, Sri Lanka, on 24th July 2001. 14 members of the LTTE Black Tiger suicide squad initially infiltrated Katunayake military air base. After destroying electricity transformers to plunge the base into darkness, they began an assault using rocket propelled grenades, anti-tank weapons, and assault rifles to attack military aircraft. A total of 26 military aircraft were damaged or destroyed. Six terrorists then crossed the runway to nearby Bandaranaike Airport, where they began attacking SriLankan Airlines planes. The airport was immediately shut down as hundreds of foreign tourists and workers scrambled to escape gunfire and explosions which ripped through parked aircraft and lit up the morning sky. An Airbus A340 was destroyed by an explosive charge; an A330 was destroyed by a rocket. In addition, two A320s and an A330 were damaged by gunfire. All 14 terrorists were eventually killed. Six Sri Lankan air force personnel and one soldier also died. The incident left half of SriLankan Airlines’ fleet out of commission. The cost of replacing the civilian aircraft was estimated at $350 million USD. The attack caused a slowdown in the economy of Sri Lanka, which relies heavily on tourism. The LTTE is one of the world’s most feared terrorist organisations, and they are notorious for using men, women and children in suicide operations. “Tamil Tiger” recruits are given a rigorous military training and ideological indoctrination. On passing out, each one is handed a cyanide capsule to be worn around the neck. Martyrdom is achieved through avoiding capture by suicide. In 1999, suicide bombings resulted in the death of 30 persons and injury to 143 others in Colombo, Trincomalee, Batticaloa, Jaffna and Medawachchi. In January 2000, a suicide bomber killed more than a dozen and wounded several passers-by when she detonated her bomb outside the Prime Minister’s Office after being detected by security personnel. In March 2000, as many as eight LTTE terrorists attacked a government motorcade traveling on a major Colombo thoroughfare, killing 25 people and wounding many others. In June 2000, a suicide bomber assassinated the Minister for Industrial Development in a Colombo suburb. Twenty-one others were killed and 60 people were injured in the attack. In October 2000, two American and one British women and their Sri Lankan driver were seriously injured in their vehicle in Central Colombo when an LTTE suicide bomber confronted by police exploded his device rather than surrender. Three policemen were killed. In October 2001, an LTTE suicide bomber stopped by police in the vicinity of an election rally in Colombo detonated his device rather than surrender, killing five people and injuring 16 others. The LTTE conducted suicide bomb assassinations against Sri Lankan President Ranasinghe Premadasa in 1993 and Indian Prime Minister Rajiv Gandhi in 1991. In addition to individual suicide bombers, vehicle-mounted bombs have been used by the LTTE. The LTTE detonated two massive truck bombs directed against the Sri Lankan economy, one at the Central Bank in January 1996 and another at the Colombo World Trade Centre in October 1997. In January 1998, the Temple of the Tooth, an important religious and tourist site in Kandy, was subjected to a truck bomb; eight people were killed, and the temple, nearby businesses and a hotel were severely damaged. Small bombs have frequently been placed against infrastructure targets such as telephone switchgear or electrical power transformers. Public buses have also been the targets of terrorist attacks. In September 1999, bombs were detonated in buses in separate incidents in Negombo and Badula. In one week in February 2000, seven separate explosions of bombs left on public buses in Colombo and other cities killed three and wounded over 140 people. Bombs have also been found on trains and on train roadbeds, resulting in one death and injuries to over 50 people.